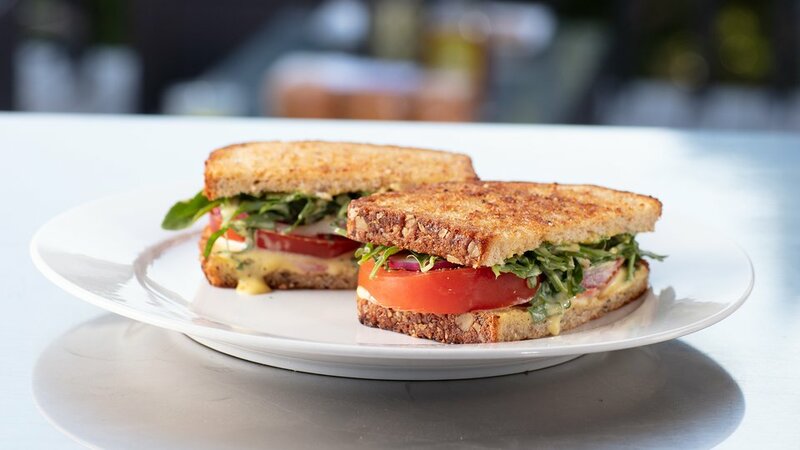 As Chef Irvine insists, there's nothing more amazing than a simple tomato sandwich. As we head into tomato harvest time, this is one recipe you’re going to want to print out and put on your refrigerator. Put together some nice beautiful tomatoes, a nice aioli, and the crisp crunch of a wholegrain bread and you’re ready to treat your family, your friends, and yourself to what may be the high point of summer fare. Place small sauté pan on medium-to-high heat. Immediately add bread slices to pan and brown only one side of each slice. When bread is browned, remove from pan and set aside. Prepare aioli by combining egg yolk, oil, lemon juice, salt, and pepper. Either whisk by hand or use a small food processor. Set finished aioli aside. Slice tomatoes into approximately 1/4-inch slices; sprinkle with salt and pepper to taste. Spread a generous amount of aioli on the untoasted sides of the bread (reserve some of the aioli for later). Place the tomato slices on top of the aioli on one slice of the bread only. Cover the tomatoes with the chopped basil, sliced radish, and red onion. In a small bowl, combine arugula with leftover aioli, mix gently, and place on top of red onion slices. Place the second slice of bread, toasted side up, on top of the sandwich, press down firmly to let the ingredients mingle, and serve.